Remember the redneck riots after the election in 2012? Me neither. Democrats and the “mainstream” media warn us constantly about the threat of violence from the Right. But nearly all violence that actually materializes is from the Left. CBS News highlighted comments on social media that 11/9, the day it became clear Donald Trump will be the next president, is “the new 9/11.” Prominent celebrities, pundits and politicians liken Mr. Trump to Hitler. Death threats abound on social media. Democrats and “mainstream” journalists (I repeat myself) have settled on their narrative for this election. It has yet to dawn on the latter that they lost worse than the former on November 8. “This was a whitelash,” said Van Jones, a former aide to President Barack Obama, on CNN. Mr. Trump’s election is a triumph “of nativism, authoritarianism, misogyny, and racism,” wrote David Remnick in the New Yorker. The narrative bears little relation to the facts. Hillary Clinton lost 403 mostly rural counties President Obama won in either 2008 and 2012. Because most are in Rust Belt states Donald Trump won narrowly, they were decisive. 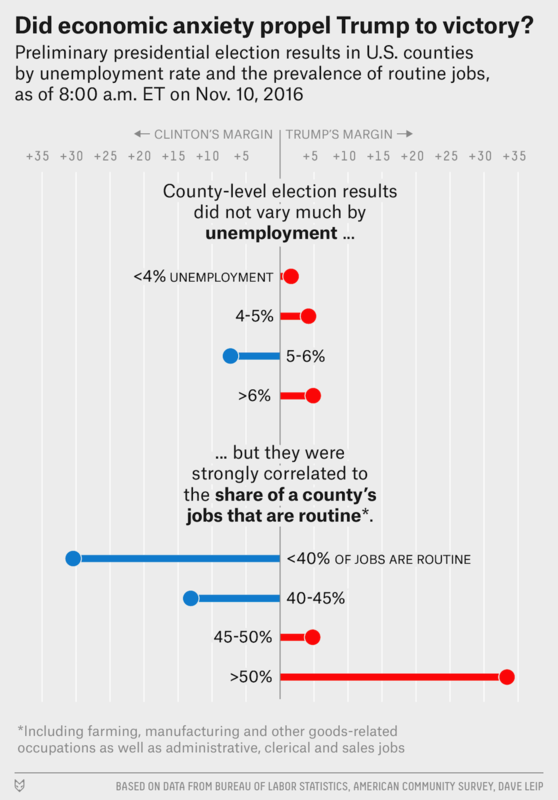 Low income whites in those counties voted for a black man twice. To call them “racist” because this time they didn’t vote for an old white woman is as preposterous as it is vile. There’s more uncertainty about what a Trump administration portends than for any other president-elect in history. The over the top defamation of The Donald and his supporters makes many who didn’t vote for him (I wrote in Abraham Lincoln) glad he won. “Progressive” hysteria makes it easier for Mr. Trump to succeed because it sets the bar for success so low. “By making Trump out to be such a vile, erratic, destructive loon,” the news media guarantee “that unless he reenacts the Slaughter of the Innocents he will outperform expectations,” wrote columnist Liz Peek. Working class whites – long the backbone of the Democrat Party – voted this time for a nominal Republican. Calling them names isn’t the best way to bring them back into the fold. “That’s the fantasy, the idea that if we mock them enough, call them racist enough, they’ll eventually shut up and get in line,” Mr. Rahn said. Hillary’s lifetime ambition has been crushed. Most of Barack Obama’s legacy will be erased in the first few weeks of the Trump administration. But they weren’t the biggest losers. But their credibility is shot. Their level of trust is at an all-time low. Watching the faces of television news anchors “collapse like the Nazis in Raiders of the Lost Ark when President-elect Donald Trump crossed 270 was one of the great moments of my life,” said conservative columnist Kurt Schlichter. “Trump knew what he was doing when he invited his crowds to jeer and hiss the reporters covering him,” Rahn said. “They hate us, and have for some time.” With very good reason. — Jack Kelly is a former Marine and Green Beret and a former deputy assistant secretary of the Air Force in the Reagan administration. He is national security writer for the Pittsburgh Post-Gazette. This article originally appeared at To The Point News. Rod D. Martin is a technology entrepreneur, venture capitalist, hedge fund manager, author and conservative activist from Destin, Florida.